Pop Goes The Weasel is the 5th of the Alex Cross books. This James Patterson novel was released on October 19, 1999. Detective Alex Cross is in love. But his happiness is threatened by a series of chilling murders in Washington, D.C., murders with a pattern so twisted, it leaves investigators reeling. 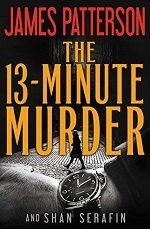 Cross’s ingenious pursuit of the killer produces a suspect – a British diplomat named Geoffrey Shafer. But proving that Shafer is the murderer becomes a potentially deadly task. As the diplomat engages in a brilliant series of surprising countermoves, in and out of the courtroom, Alex and his fiancee become hopelessly entangled with the most memorable nemesis Alex Cross has ever faced.